When you first see the Rock of Gibraltar, you cannot fail to be impressed by the visual impact of its stature, towering isolated above the surrounding countryside. 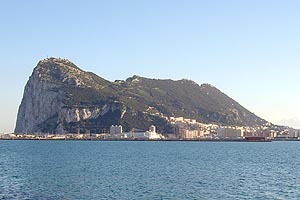 At ground level, Gibraltar consists of a narrow peninsula linked to the North to the Iberian Peninsula by a narrow sandy isthmus. The Airport is built on this flat area, and the frontier with Spain. The Eastern side is made up of sheer cliffs, reaching a maximum altitude of 426 metres with sandy beaches forming the perimeter. The western slopes are gentler and much of its lower half is taken up by the city, with the upper parts having been made into a large nature reserve. This page uses pop-up windows, please ensure this feature is not blocked. For the person interested in natural history, whether it is on land or sea, Gibraltar is incredibly rich and full of surprises at any time of the year with a wide array of plant life, many of which are native to the area, the Rock Apes, dolphins in the Bay of Gibraltar, and other marine mammals which include the Pilot Whales of the Strait, Killer Whales and even larger species such as Sperm Whales. Gibraltar also has its own unique bird: the Barbary Partridge and not to be missed is the spectacular migration of birds when you can see several thousand of up to fifteen different species in a single day including birds of prey, storks, vultures, songbirds and seabirds. In spring, the time when many birds breed, and others arrive from the south, many insects, including beautiful butterflies, emerge, making Gibraltar a truly beautiful paradise for wildlife. Our climate can be summarised as having a summer drought and high temperatures with cooler weather arriving with the rains any time between October and Christmas. We are aware of the limited time on your visit. There are so many places to visit on the Rock that a short visit will only leave you wanting to see more. Taking 'The Official Rock Tour' by taxi or by coach is the best way to visit some of Gibraltar's most interesting sites. The tour lasts approximately 90 minutes so at each stop you will have plenty of time to look around. The Gibraltar Botanical Gardens combine the aesthetic beauty of the site with living exhibits of botanical interest and conservation value, centred around "The Dell", a peaceful area with definite Italian influence in which is displayed the coat-of-arms of Gibraltar and which holds a series of fountains, ponds, and waterfalls. The Gala Casino at Ocean Village is a glamorous location where you can enjoy a night to the fullest. With traditional casino games, a Poker zone, Gala Bingo, and a Sports Lounge. You can enjoy a range of bars and a meal in the Chargrill restaurant. The Walls of Gibraltar run around the entire inner city and were first built by the Moors. Successive battles and sieges resulted in the strengthening of the walls by the Spanish and then the British. Walking along the walls you can begin to glimpse the historic events which shaped the City of Gibraltar. Over recent years the Government has been engaged in a beautification process which has made more parts of the city walls visible. This little village nestling on the eastern side of the Rock was first used by the Genoese who followed the British Fleet, repairing the ships as required. The descendants of these shipwrights still live in this sleepy village, where there are still some who go fishing in the traditional boats. Its beach is tiny but excellent and there are a number of small pubs and restaurants in the village. The official residence of the Governor of Gibraltar since 1728, it was a convent of Franciscan Friars who took abode there in 1531. It is said that the Convent is haunted by the Grey Lady - a Franciscan Nun who was caught trying to elope with her sweetheart. The adjacent King's Chapel formed part of this convent. It has been the garrison church since the British took Gibraltar and inside, beneath the colours of several British regiments, lie the remains of two British Governors. The changing of the guard outside the Convent is one of the military ceremonies which can be seen. It takes place several times daily on week-days and special ceremonial events are held at regular intervals throughout the year. Further information can be obtained from the Gibraltar Information Centre. The guard is normally provided by the Gibraltar Regiment, part of the British Army, however sometimes you may see other visiting soldiers on duty. This Welcome Monument in the shape of the rock, depicts Gibraltar's important location throughout history. It shows the first skull of Neanderthal Man, which was found in Gibraltar, although not identified as such until later, as well as one of the pillars of Hercules, and other images which represent the many civilisations that form part of Gibraltar's rich and varied history. Closed by the Spanish Government in 1969, the Frontier reopened without restrictions on the 5th February, 1985, and is now crossed by over six million visitors each year. A model of the Port Sergeant holding the Keys of Gibraltar can be seen by the Information Centre at the Old Guard Room. This represents the tradition began by General Sir George Elliott who was Governor of Gibraltar during the Great Siege when he carried the keys of the garrison on him at all times and was even said to have slept with them under his pillow! Since then successive Governors have kept up the tradition by carrying the keys on all official functions. The only time when the keys were not in the possession of the governor was when they were handed over to the Port Sergeant for the daily ceremonial opening and closing of the gates of Gibraltar - a daily task carried out by the Garrison until the beginning of the century. The full ceremony is now re-enacted twice a year and information on when held can be obtained from the Gibraltar Information Centre in Main Street. A LEGO flag of Gibraltar 4 metres in height and 8 metres in length can be seen at the John Mackintosh Hall, which is a cultural centre housing the public library as well as exhibition rooms and a theatre. At the time of its construction, the LEGO flag was the largest flag ever made from LEGO bricks with a total of 393,857 LEGO bricks being used. Visit to one of the few glass factories in Southern Europe producing hand-made glass. Using methods which are over 2,000 years old, the glass blowers will create and shape the glass objects as you watch. A shop at the factory sells these objects at factory prices. The lighthouse at Europa Point is the most southerly of all Trinity House Lighthouses, and is the only one maintained by them outside the United Kingdom. Until recently it was manned, however like all lighthouses it is now remote controlled, although the lighthouse keepers cottage is preserved. Still in use today by many small businesses, the foundation stone for the new public markets was laid by the governor Sir Charles Monro on the 20th June, 1928. The Gibraltar Museum is centrally located at in Bomb House Lane within the City, just one minute walking distance from Main Street. It has a rich content covering all aspects of Gibraltar's history and natural history, and is therefore a must for every visitor. It houses the best-preserved Moorish Bath House in Europe and contains a rich collection of artefacts, weapons, medals, costumes, coins and postage stamps, together with a magnificently detailed old model of the Rock, constructed by officers of the Royal Engineers in 1865. This former mosque was converted into a Catholic chapel in 1462 after the capture of Gibraltar by the Spanish. Since that time, a light was kept burning in a tower above the chapel - a forerunner to our present day lighthouse at Europa Point. Our Lady of Europa has been venerated through the ages by seafarers, many of whom presented rich gifts to the Chapel. However, the greatest "treasure" - the statue of Our Lady which was brought back to Gibraltar in 1864, can still be seen at the Shrine. Europe Day (5th May) is now celebrated annually. Outside the chapel, there is a fragment of pavement once thought to have dated back to the Moorish occupation, but which is more likely to have been laid down around the beginning of the 18th century. There is also an old whipping post which dates back to the time that the shrine was used as a guardroom by the British. Situated just outside the city walls, by Southport Gates, it was Gibraltar's Military Cemetery. It was named The Trafalgar Cemetery in memory of the casualties of the Battle of Trafalgar who were buried in these grounds. Every year, on Trafalgar Day, a ceremony is held here to commemorate the great victory. The flora and fauna of the Upper Rock Nature Reserve are of conservation interest. Within it are many of the animals and plants described in the Natural History section of this Fact File but the highlights are the Barbary Macaques (the famous Rock Apes), the Barbary Partridges, and flowers such as Gibraltar's own Chickweed, Thyme and Candytuft. Admission into the Nature reserve between 9.30 in the morning and sunset is by entrance ticket. The recommended way of visiting the reserve is by taking a Rock Tour or, alternatively, via the Cable Car. The buildings in which this exhibition is housed are probably among the first constructed by the British in Gibraltar. A major feature is the graffiti on the walls, the earliest dated 1726. The now famous labyrinth of tunnels inside the Rock ,includes the Great Siege Tunnels, and is arguably the most impressive defence system devised by humans. This monument was commissioned to depict the "Passage of Time" and Gibraltar's association with the Pillars of Hercules and shows Hercules supporting the world. The accessible part of the old castle is the Tower of Homage which dominates the hill side and landward approach to Gibraltar. It dates to the year 1333 AD. Seen to the right is one of the three Marinas. The "apes" are really tail-less monkeys found wild in Morocco and Algeria, with the ones on the Rock being the only free-ranging ones in Europe. At the Apes' Den (Queen's Gate) or around the Great Siege Tunnels you have the opportunity of seeing these fascinating monkeys at close quarters. Please remember that although they are normally well behaved, they are wild animals and despite their relative size can be dangerous. St Michael's Cave, has attracted visitors since Roman times and during World War II the cave was prepared as an emergency hospital, but it was never used. The Cathedral Cave is open to visitors and is also an unique auditorium for concerts, ballet, drama and presentations. Main Street, with its adjoining lanes and byways offers a large selection of goods, transforming this area of Gibraltar into what has often been called the shopping centre of the Western Mediterranean. The range of gifts is quite enormous whether it be delicate glassware, priceless porcelain, an unusual piece of pottery, leatherware, perfumes, spirits, jewellry, silks or cashmere. Gibraltar has the most cosmopolitan variety of goods at the most competitive tax reduced prices in Western Europe. The currency is Sterling, with notes issued by the Government of Gibraltar. UK notes are accepted as are Euros by most shops and bars but not by the Post Office. If you require to change any other currency into pounds, a large number of Banks and Bureaux de Change are available. Credit and Debit cards are accepted in most places. Large Euro notes may be refused due to the possibility of fraud. Gibraltar issued notes are not legal tender in the UK but must be exchanged at banks there, or at local banks on a 1:1 basis.